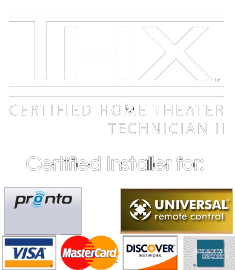 The Seattle homeowners for this project had a family room that they wanted to transform to a theater setup to enjoy now and as an investment to add to the resale value of their home. 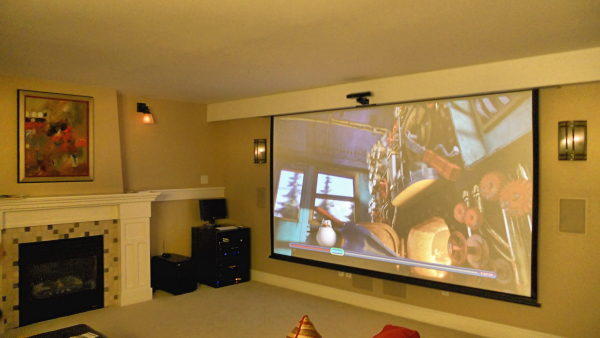 They already had a great family room they enjoyed, and they wanted the theater to have minimal visual impact when not in use. Theater Design Northwest created a large screen projection design by building a matching soffit for the motorized 135″ screen to disappear into when not in use. A compact custom rack by us houses a fairly massive multimedia assault: Directv, Wii U, Xbox Kinect, Sony WiFi Bluray, 5.1 Airplay via the Pioneer Elite, plus a Mac Mini. Also featured is a dual monitor setup with an HD computer monitor that is used for Garageband music practice or iTunes song selection without needing to turn on the big screen projector. With so many “connected” components, we expanded their network so all devices are connected via hard wired ethernet. The clients got just what they wanted within their stated budget and at last report, this system has been seeing judicious use as a family fun center.